I have just returned from five days fly fishing Czech Republic. This was a trip to the Otava River in the Sumava National Park, better known as Bohemia. The area is a continuation of the Bavarian Forest of Germany, where I spend my summers. Due to the language difficulties, I had not previously thought of visiting the area, despite it being so close by. I decided to put this right and contacted Jan Siman at goflyfish.cz. Jan runs a Fly Fishing School and Guide Service from his Fly Fishing Tackle Shop in Susice. He also runs an on-line fly fishing shop, and sends out essential supplies to clients all over the world. Jan was a member of the famous Czech Fly Fishing Team that won Gold at the 10th World Fly Fishing Championships in Wales. He therefore knows a thing or two about the sport and is a wealth of information. One of the perceived problems of fly fishing Czech Republic is the subject of licensing, but Jan is used to dealing with foreign fly fisherman and has dealt with the ‘problem’, just leave it to him. That is exactly what I did! I left Jan to sort out my accommodation, licensing and permits after booking a package which included accommodation, permits and licenses, a small box of flies and a day exploring the River Otava. I duly arrived at the charming Hotel Gabreta in beautiful Susice on the Sunday afternoon and found that it was only a hundred meters from Jan’s shop, where I was due to meet him the next morning. That afternoon Jan visited me at the Hotel to sort out the question of permits and licenses, there being a number of options available, including a visitors one month license. Living so close to the area, I opted to join the local fishing club and take a 10 year license and annual permit. This required that I pass the State Fishing Examination, which, with Jan’s assistance as translator, was accomplished without problem. The following morning I met with Jan at his shop and drooled over the fly tying materials and tackle on display. We completed the paperwork and whilst Jan’s associate went off to sort out my permits and licenses, we set off to explore the Otava River. This beautiful river, centered on Susice, has five beats, over 58 Km. One of these is the ‘Trophy Stretch’, which is privately owned and therefore has an extra fee to fish it. The Otava is the most significant and important river in the western part of Sumava. The river has an abundance of native Brown Trout and Grayling. The Otava has been stocked with Rainbow Trout and American Brook Trout. The latter, are also known as Brook Char, and in Germany as Saibling. The upper part of the Otava River has a typical mountain stream character with rapids, fast streams and deep pools. The middle and lower stretches, from Susice to Strakonice are more gentle in character, with longer pools. Jan took me to each beat of the river and pointed out access points, likely fishing spots and local amenities. Jan told me that there had recently been bad flooding in the area. He thought it possible that this would adversely affect the fishing. How wrong he was! Jan gave me so much information that by the end of the day, I was bemused as to which spot I wanted to fish first. By this time, Jan’s assistant had obtained my license and permits and I was free to fish. The following morning I awoke at dawn and together with my faithful dog, walked the 200 meters to the weir at Susice. Here, Beat 7 flows slowly through a beautiful park before dropping over the weir. For the next few hours until breakfast-time, I had great fun with a dry-fly. After breakfast, we set off for a mornings fishing, setting the pattern for the next three days. My four days fly fishing on the Otava resulted in a haul of thirty-five fish! Four of these were small native Brown Trout, one was a Rainbow, and thirty were American Brook Trout. I caught the majority on nymphs and on three occasions, I caught two Brook Trout at the same time. Jan was right in one respect, the flooding had affected the river! This was to the fly fisherman’s advantage on the lower stretches as 15,000 Brook Trout had been washed out of a local fish farm! 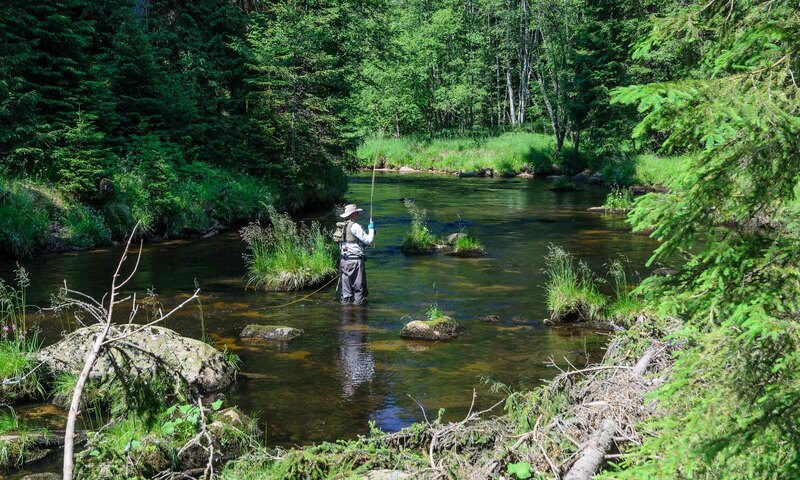 The Sumava National Park is a beautiful area to visit, and even better if you intend Fly Fishing Czech Republic. It is a veritable Utopia, and now that I have discovered it, I will be returning to the Otava River at every opportunity. Have a look at the YouTube video and see for yourself.